Today’s feature is a re-run of a post published here on Oct 2, 2014, with the hope of finding more information about the vehicles in the images, and if any of them have survived. Charles Hayer reported the following information. Promotional car used by the Troy Hills Speedway in Troy Hills, New Jersey. Photo circa 1930. If you have any new information about either track or the automobiles, please send us a comment. 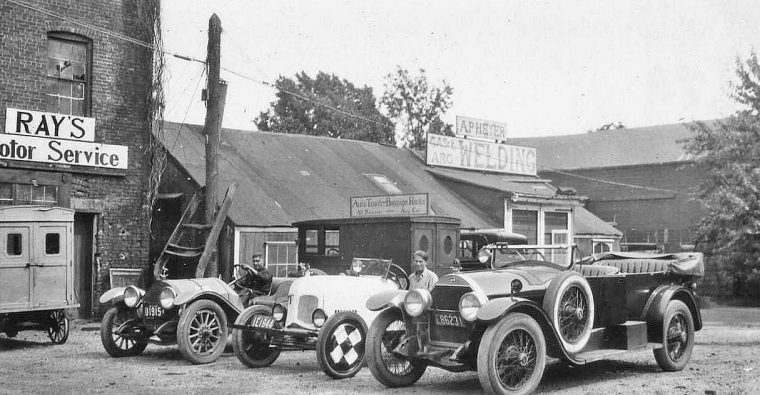 Mercer Raceabout, Model T Ford Speedster and a Stutz Touring car at “Ray’s Motor Service” Montclair, New Jersey. A.P. Heyer’s Welding shop is behind these automobiles. The following article “Repair Row – Montclair, New Jersey” about A.P. Heyer was published here on September 9, 201 4. Many towns and cities usually have an area that caters to industrial uses and the service trades. This circa early-1920s photo courtesy of Charles Heyer shows what appears to be one of these spots located in Montclair, New Jersey. Behind the three cars in the photo (above) is an enclosed truck with a sign on its roof advertising “Auto Trunk and Baggage Racks.” In front of that truck and to its right is A.P. Heyer’s Welding Shop where both gas and arc welding services were offered. Like most shop operators in his line-of-work, he was a clever individual; one of two submissions by him are found in the November 10, 1915, Motor World that shows a pair of his adaptions. In Auto Repair Shop Short Cuts 1918 by Motor World, you can view a rig Heyer used for holding crankshafts in alignment while welding them. If you have any new information about the automobiles, or A.P. Heyer please send us a comment. 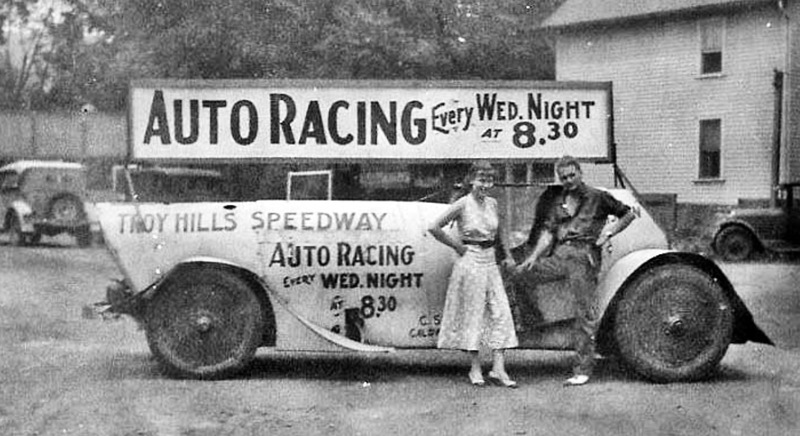 This entry was posted in Auto photos 1921 - 1942, Auto Racing 1894 - 1942 and tagged Model A or B Ford Racing Car, Par-Troy race track, Parsippany-Troy Hills New Jersey Area Race Tracks, Troy Hills Speedway, Troy Hills Speedway promotional car. Everything about the little racer — the shape, the mechanicals, the ingenuity — is cool. One of the most interesting homebuilt cars I’ve seen. 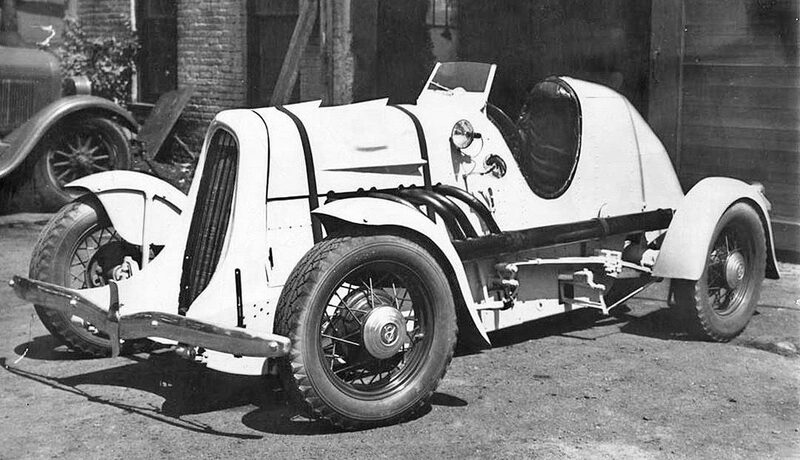 David, the moment I saw the image of “Lucky 13” I thought how many design cues might have been lifted from Ab Jenkins famous Duesenberg Special Record Car. The time frame is right. Am I just seeing things? My first thought upon seeing it was “Mini Mormon Meteor”. I like it. It is well done. I lived just east of Montclair NJ for 25 years and thought I knew the location as behind the old trolley barn on Bloomfield Ave., but that was an old coal dealer/plumber named John Heyrich. I did find a reference to Boy Scouts activity in 1916 mentioning “… Arthur P. Heyer, town commissioner and auto company owner…”. Born 1876, passed away in 1943. 1940 census shows him with an occupation of ‘service engineer’ ‘manufacturer of automotive equipment’. Chis Economaki knew this Montclair racing area in person, and his book “Let ‘Em Al l Go” describes it well. It is a bit of an optical illusion, isn’t it. Your eyes see the six holes in the bodywork and want to believe there are six pipes to match. My guess would be the car was raced with a six and then “detuned” for street use by installing a four cylinder engine. The unusual ad hoc installation of headlights looks like the driver could have just reached out and tipped them up or down for high and low beams.